Eazy HTTP Headers provides two check boxes for settings on the general settings page. 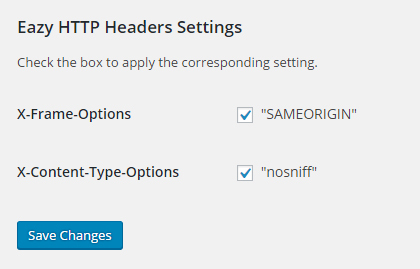 The check boxes, when checked, activate two functions built into WordPress, send_frame_options_header() & send_nosniff_header(). Controlling what your HTTP Headers allow is one of the easiest ways to configure the relationship between your website and the users browser. 1. Install and activate Eazy HTTP Headers. 2. Navigate to the General Settings page in the admin. 3. Look for the Eazy HTTP Settings section towards the bottom. 4. Check the boxes for the corresponding headers you want to set. You can request your sites HTTP Headers by looking at the response to an HTTP request. securityheaders.io provides an easy to use interface to verify your sites headers.